#leadershiptruth - Disagree with your boss. 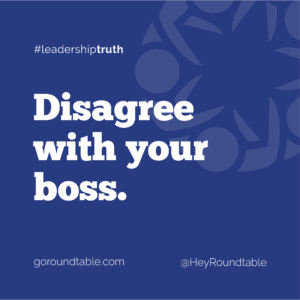 #leadershiptruth – Disagree with your boss. Can you be too supportive of your boss? The research says, yes! Our assessment partners at MRG spend a lot of time studying the behaviours that make for effective leadership and one of the (not-so-surprising to me) ones is that leaders who demonstrate a lower than average deference to authority are seen as more effective than those who are overly compliant to their bosses direction. In all my years working with high potential leaders, I’ve known this to be one of the separating factors. Being a ‘yes’ man or woman is NOT going to secure you a strong future. Think about it: wouldn’t you rather have direct reports that speak up if they see you about to drive over a cliff or ones that would merrily pull out the GPS too and go over it with you? I know what I value on my team. Of course, this doesn’t mean that you should turn into an argumentative a-hole on every issue, but it does mean that when you see something is going off the rails or when you have a point of view that is a win-win for you, your team and your organization, you need to speak up. Being a good team player doesn’t mean that you subjugate your opinions based on somebody else’s title and rank.